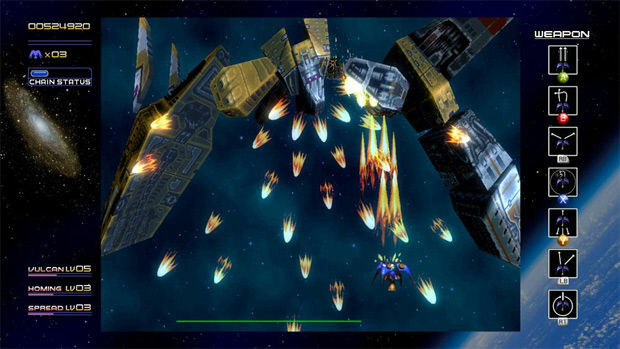 Some four years after Treasure's Masato Maegawa hinted at a re-release of one of the finest shoot-'em-ups ever to grace the world, Radiant Silvergun is finally available on Xbox Live Arcade for a fraction of what the Saturn game used to go for on eBay. 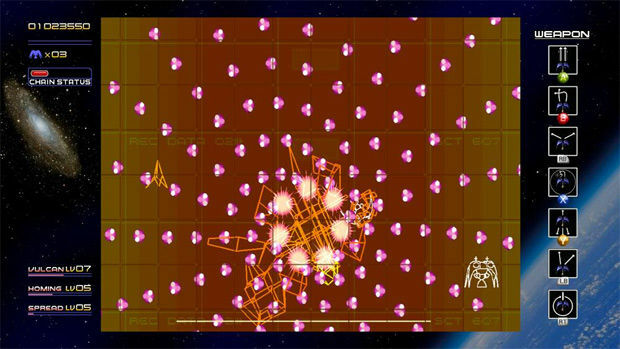 Shmup enthusiasts will no doubt have blindly picked up this new version of the game the moment it came out, but not every classic from the '90s has made a successful revamp on current-day digital platforms. Thankfully, just like Ikaruga, Radiant Silvergun on XBLA is everything that made it great, and more. 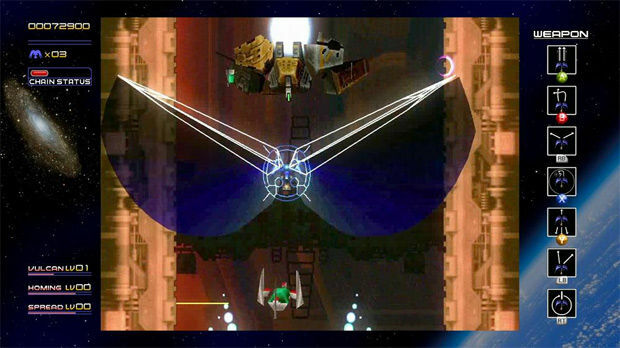 Radiant Silvergun distinguishes itself from the typical shmup primarily through its approach to weaponry. You have access to seven different weapons right off the bat, and the more you score with each weapon, the stronger it will slowly become as it levels up. This can be a bit overwhelming to those new to the game, but a couple of attempts and a dozen deaths later it becomes second nature. Weapons range from the typical frontal and backwards shots to sideways-shot bombs that explode when you release the button, to homing missiles, lasers, and plasma shots; there's a weapon for any situation and any type of player preferences, although you'll want to hone your skills with each weapon to utilize them where they are best used. Finally, you have the Radiant Sword. When held, this will project a sword from your ship that moves around as you move your ship around. The Radiant Sword eats up some of the bullets to clear a path through bullet hell and once it has had its fill, you can activate a Hyper Sword attack to do massive damage to a large area of the screen. By destroying three enemies in a row of the same color, you receive a chain combo bonus. If you are serious about reaching a score worth writing home about, this is where you'll have to keep practicing at over and over again. Each time you follow up one chain with another of the same color, your bonus will multiply, making it worth it to ignore that one ship here and there in favor of keeping your combo chain going. If you have an Achievement in Ikaruga, you can also unlock Ikaruga Mode which keeps chains going per three same-color kills instead of per color alone. As many enemies as there are to chain for those delicious combos and high scores, Radiant Silvergun has no shortage of bosses that it throws in your face left and right. You could just rid yourself of these bosses by simply destroying their key components, but destroying a boss piece by piece provides you with more points and an extra chance to level up your weapons. Compared to other shmups both old and new, Radiant Silvergun still holds up great. 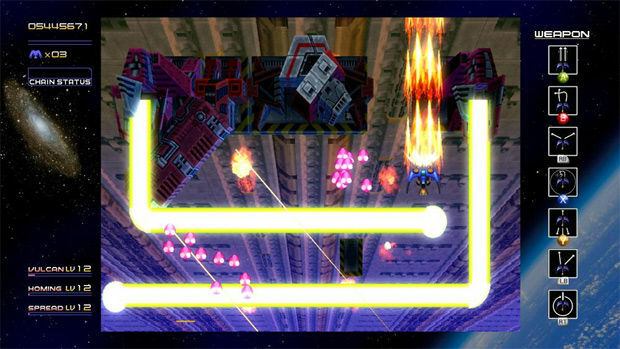 The level and enemy design combined with the deep weapon options at hand are a dream to play, the bosses are varied and challenging without being cheap and while it's hard to enough to even finish the game, factoring in the chain system makes the game even harder to complete with a decent score. The primary difference between the Arcade and Story modes on offer is the -- *gasp* -- story in Story mode, and the ability to save your weapon progress. Story mode offers some screaming Japanese characters in anime-style panels that now have localized subtitles, as much good as that will do you in understanding what is going on. More interesting is the ability to save your weapon leveling progress upon death and then starting from the beginning with your upgraded weapons intact. The Xbox Live Arcade version provides what you'd expect from a current-day port with some nice touches to boot. As the original Radiant Silvergun has a 4:3 aspect ratio, you are stuck with some leftover screenspace on a widescreen display. You can fill it with a number of background wallpapers and even change their brightness if you want, with optional button info for the various weapons displayed on the right-hand side by default. The amount of customization borders on the ridiculous. A myriad of display options can be configured and tinkered with as you please. The display size for the game proper can be changed, as well as the horizontal and vertical positioning, while the total screen size can be adjusted in all four directions to match your TV preferences. More importantly, the graphics have received a high resolution update that looks pretty good if you don't know, or don't remember, what Radiant Silvergun used to look like. Initially it doesn't quite impress visually by today's standards, especially the laughably blocky textures on the bosses. Switch the high-res graphics to the low-res original format during a busy fight in-game, however, and the resulting blocky sprites will make you appreciate the level of increased detail Treasure has put into this version. You can choose between the original low-resolution graphics, a smoothed-out version of the old graphics, the new high-res graphics, and finally the high-res graphics with fancy new effects. Even the translucency options can be toggled if you please. Besides the graphical update, online leaderboards and online multiplayer have been added to the game, which even gives you subtitles for the Story Mode's wacky dialogue. Not that it makes the story any more comprehensible; if you didn't know what was going on in 1998, reading the dialogue in English won't change that much. In a nutshell, though, everything you'd want from a XBLA version of Radiant Silvergun is here. Control-wise it will just depend on what you are stuck with. Using the Xbox 360 controller, all weapons are mapped to one button each by default. Again, this can be a bit overwhelming for novices but training and the ability to swap to the traditional three-button arcade layout, where different button combos fire different weapons, removes any obligatory annoyance you may have with this. Overall, the standard controller suffices for those without a fightstick or a fightpad with an actual d-pad that is worth a damn, but only barely; your ship is easy enough to control with the analog stick, albeit lacking in precision and definitely not the control method of choice for most. Using a standard Hori EX 2 fightstick, Radiant Silvergun works like a charm. For some reason, however, the game lets you press any button to map to any weapon you want, but flat out refuses to do so for the left and right triggers. You can still remap everything as you please by simply cycling through all the buttons per weapon, so it's not a huge issue even if it is an odd one. What's even better is that you can simply swap from a controller to a fightstick and vice versa by pressing Start on the respective controller at the title screen. The game will still want you to sign in again, but you don't have to go through that awful process of manually signing out on one controller just so you can sign in the same profile on another controller. I could really have used that feature during my Guitar Hero and Rock Band days. The Arcade and Story modes on offer give you the core shmup experience with plenty of options for each to fit any type of player. You can give yourself more continues and whatnot, but only the Score Attack modes where you have limited lives can be uploaded to the leaderboards. Between the core modes, the high-res graphical updates, and more options than you're likely to use, you can safely throw away that overpriced Saturn copy and stick with this latest iteration of the game. Make no mistake, though: you will die, you will die often, and you'll have to accept that you might be one of many who will most likely never finish it -- let alone in Score Attack mode. 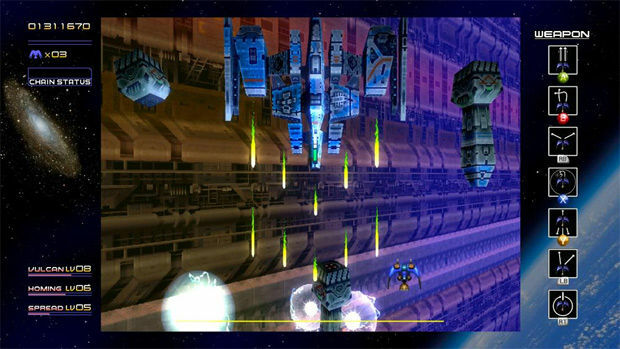 If that makes you think twice and if you bought Ikaruga only to play it a couple of times before giving up, Radiant Silvergun is not likely to be that one game that finally makes you complete a shmup. For the shmup enthusiast it's a different story. 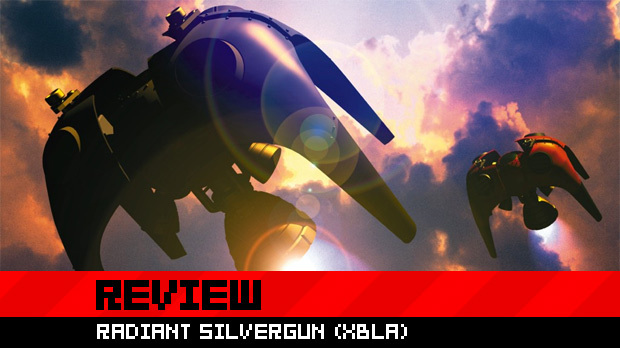 Radiant Silvergun doesn't just hold its own against the contemporary competition, but offers the classic game with different graphical skins and a host of options to reach a far wider audience than ever had the chance to experience its excellence before.